You are here: Home > What is normal birth? There’s an old saying that to a hammer, everything is a nail. It means that if you only know how to do one thing, you will insist that is what needs to be done. Consider, for a moment, the possibility that there was a handyman, Bob, who only knew how to use a hammer. Whenever he was called to a job, he brought his trusty hammer and banged in the nails. 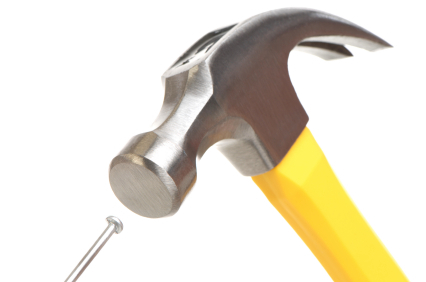 Imagine that a new handyman, Steve, comes to town and he knows how to use a hammer AND a screwdriver. He can do twice as much as the original handyman and as time goes by, more and more people call Steve, since many of their projects involve nails and screws. He could always learn to use a screwdriver, but that might be difficult for Bob. What else might he do? He could insist that screws can be pounded in. He could insist that screws are an unnecessary use of technology; anything that can be made with screws could also be made with hammers. He could insist that Steve invented screws just to take business away from him. He could insist that Steve recommends screws for a project when nails would have been just fine. He could insist that only things assembled with nails are normal. All of these strategies share one thing in common. They imply that being able to use a screwdriver is unnecessary regardless of the situation. This is not a real world situation, of course; it is an analogy. Midwives are the people with hammers. Normal (or natural) birth is nails and screws are anything that obstetricians can do that midwives can’t. There has a been a lot of debate in midwifery circles about what exactly constitutes normal birth. Natural birth has long held iconic status within midwifery and alternative birth movements around the world that have sought to challenge the dominance of biomedicine and the medicalisation of childbirth… The recent transition of midwifery in several Canadian provinces from a social movement—for which “reclaiming” natural birth was a critical goal — to a regulated profession within the formal health-care system is a unique opportunity to track changes in how natural birth is understood and experienced. Midwifery in Canada has much in common ideologically with independent or direct-entry midwifery in the USA and with radical and independent midwifery in the UK and so insights about changes in Canada have implications for maternity caregivers in a range of health systems. … For example, a woman asks to have her membranes artificially ruptured after several hours of labour to “get things going” and gives birth vaginally at home… The presence of medical interventions within the realm of natural birth is a relatively common kind of border crossing. That is the key point. Anything is acceptable as long as it can keep the birth within the scope of midwifery practice. Normal birth has nothing to do what is normal and almost nothing to do with birth. It’s all about midwives keeping patients for themselves. Just like Bob the handyman, a midwife faces a difficult choice when confronted with a patient who needs advanced technology like a C-section. She also has several choices, remarkably like the choices from which Bob can choose. She could insist that the patient can give birth safely without a C-section. She could insist that C-sections are an unnecessary use of technology. She could insist that obstetricians recommend C-sections just to take business away from midwives. She could insist that obstetricians routinely recommend C-sections when vaginal birth would have been just fine. She could insist that only vaginal birth is normal. Homebirth midwives and midwifery theorists in the UK and Australia use all these strategies. What women need to understand is that midwives define normal birth by what is good for THEM, not what is good for women or safe for babies, and certainly not by what is actually normal. A baby is breech and the midwife can’t do either a version or a C-section for breech. She insists that breech is a variation of normal. A baby is postdates and the midwife can’t do a postdates induction with pitocin. She insists that babies aren’t library books and they don’t have to be born on a specific date and for good measure, she insists that pitocin causes ADHD, autism, or whatever condition you might fear. I could go on and on, but you get the idea. Anyone working with a homebirth midwife or any midwife captured by radical midwifery theory needs to ask herself: Are my midwife’s recommendations motivated by what it good for me and safe for my baby? Or are my midwife’s recommendations motivated by what will allow her to maintain control of me as a patient? All women researching birth need to ask themselves: Does “normal birth” actually mean anything, or is it just a way for midwives to make what they can do seem most desirable? Personally, I think the answer is clear. Normal birth has nothing to do with normal and nothing to do with birth. The definition of normal birth is simple and straightforward: If a midwife can do it, she calls it normal. If she lacks the skill to provide the needed care, she insists that the birth is not normal even if it results in a healthy mother and a healthy baby. We’d rightly be suspicious of a handyman who insisted that only things assembled with nails are normal. We should be equally suspicious of a midwife who insists that only things that are in the scope of her practice represent normal birth.